Australia brushed aside Kuwait 4-0 in a friendly on Monday to hand coach Graham Arnold victory in his first game since taking charge. Former Sydney FC coach Arnold replaced Bert van Marwijk after the 2018 World Cup and kick-started his reign with a comfortable win. Played in front of a sparse crowd at Al Kuwait Sports Club Stadium, the visitors went ahead in the 12th minute when Khaled Hajiah put through his own net. Robbie Kruse's dangerous cross from the left was met by the defender, who headed past his own goalkeeper from 10 yards out. 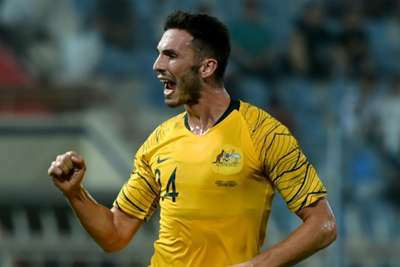 Apostolos Giannou has his first international goal for Australia! Nine minutes later Apostolos Giannou took advantage of some slapstick defending to prod past Hameed Al-Qallaf from close-range. The goalkeeper then did well to tip over Mathew Leckie's effort on the stroke of half-time before getting down well to keep out Josh Risdon's low strike just before the hour mark. The Kuwait goalkeeper made a mess of Tomas Rogic's low strike in the 82nd minute, however, allowing the Celtic midfielder's tame effort from the edge of the penalty area to slip through his grasp for Australia's third. Substitute Awer Mabil – making his international debut – coolly slotted in with the outside of his boot six minutes later to add gloss to the scoreline and set Arnold up nicely for home matches against South Korea and Lebanon next month.